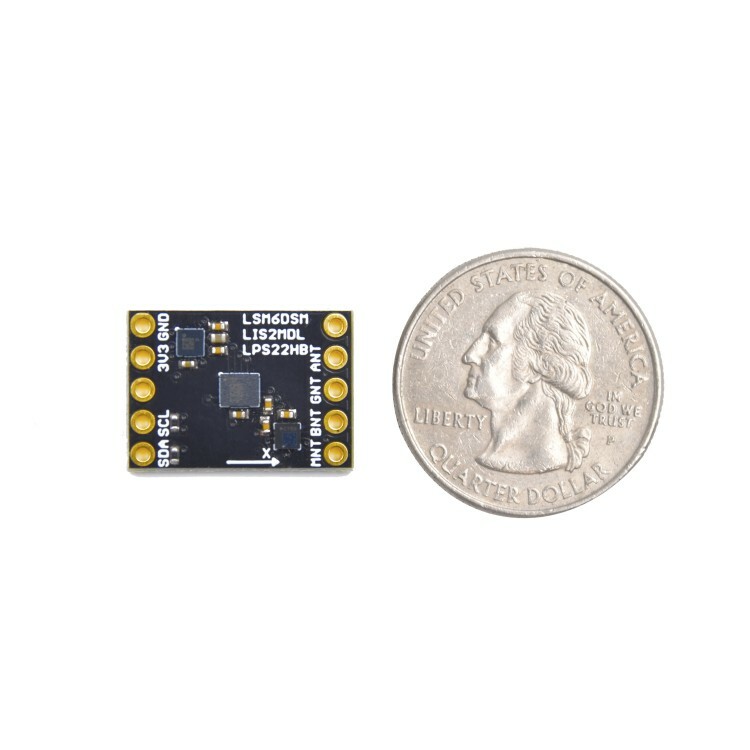 Designed by Pesky Products, this is a small (0.5 in x 0.7 in) breakout board for ST Microelectronics' latest state-of-the-art suite of MEMS sensors including the LSM6DSM combination accel/gyro with embedded sensor hub, the LIS2MDL magnetometer, and the LPS22HB barometer/temperature sensor. 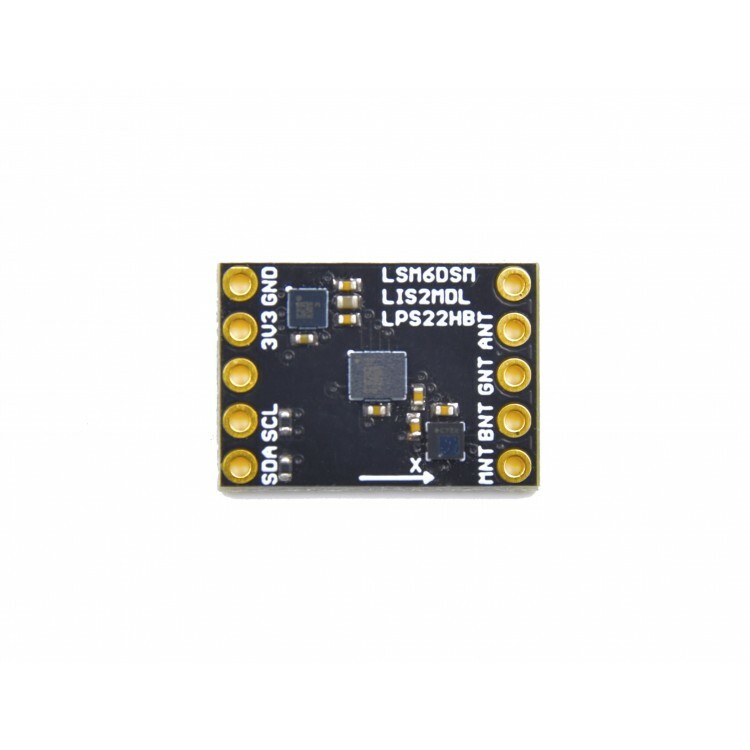 This combination provides motion sensing with 10 degrees of freedom in a conveniently small breakout for use with any 3V3 microcontroller. Why did you [Kris Winer] make it? I am always looking for the next big thing in sensors, especially motion sensors where the venerable MPU9250 is nearing its end-of-life still reigning as the undefeated champion of small, inexpensive, easy-to-use, low-jitter, and accurate 9 DoF motion sensors. I was challenged at the 2017 ST Developer's Conference to try the latest ST motion sensor offerings and I am glad I did. Preliminary tests show the LSM6DSM to be a worthy successor to the MPU6500, the accel/gyro combo embedded in the MPU9250 along with the AK8963C magnetometer. I have always liked ST magnetometers starting when I first used the LIS3MDL years ago to accompany the MAX21100. The combination of the LSM6DSM accel/gyro and the LIS2MDL magnetometer seems to produce results as good or better than the MPU9250 in terms of jitter and accuracy. In my simple 90-degree turn test, the MPU9250 routinely obtains 4-degree rms heading accuracy using the open-source Madgwick fusion algorithm at a few kHz fusion rate. Initial testing of the LSM6DSM + LIS2MDL + LPS22HB breakout showed a heading accuracy of 3-degree rms using the same Madgwick algorithm. Lots more testing is required but this sensor combination seems to perform much better than the obsolete LSM9DS0 and as well or better than the MPU9250. We might just have a new champion here! The LPS22HB is also a stellar performer, offering very low jitter pressure measurements at up to 75 Hz that translate into altitude estimation jitter of less than one foot. All three sensors have interrupts (the LSM6DSM has two) for data ready, low and high thresholds, etc. 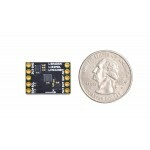 as well as an embedded FIFO for both the LSM6DSM and LPS22HB enabling ultra-low-power batch processing. Speaking of power usage, all three sensors offer low power settings: current usage for the LPS22HB is < 12 uA with a 1 uA power down mode, LIS2MDL uses 50 uA in low power mode with a 1.5 uA power down mode, and the LSM6DSM uses 290 uA in low-power accel/gyro combo mode with a 3 uA power down mode. Consult the data sheet for all the details since these sensors have a lot of embedded features in addition to a wide range of sample rates and measurement modes. 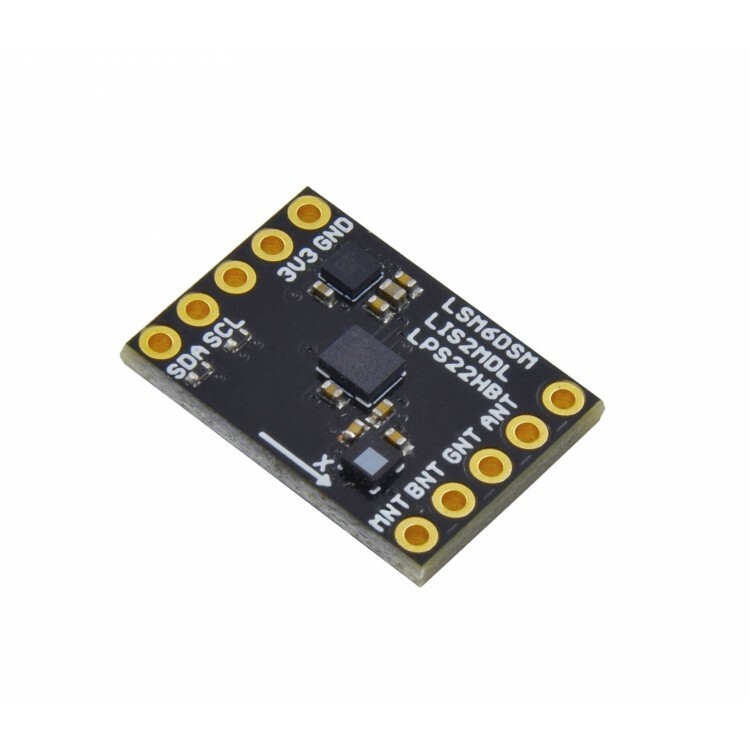 This is a small and convenient board you can use to get to know these superior motion sensors from ST Microelectronics and see if they are right for your application. Three degree heading accuracy with simple open-source fusion on the host is pretty attractive at this price. There is a nice Arduino sketch reposited on Github for the breakout board written for STM32L4-based development boards but that can be adapted to any Arduino-compatible MCU. Test it out and see how easy it is to add accurate absolute 3D orientation estimation to your projects!